Chin up bars are bars that can be used for doing pull-up exercises (sometimes known as "chin ups"). Note: Please be aware that the bar must be securely fixed or their is a risk of injury. You should inspect the bar prior to installation and use - and be aware that doorway chin up bars may be at higher risk of mechanical failure. The ProsourceFit Multi-Grip Pull-Up/Chin-Up Bar provides an inexpensive way to tone and build muscles at home, without large equipment or marring your doorframe with installation screws. Designed to slip into any standard doorways, the heavy duty Multi-Grip Pull-Up Bar can be installed anywhere you have a sturdy doorframe from 24” to 36”. And if you have a permanent location in mind, it can also be mounted to the doorframe with the optional, included J brackets. 12 cushioned grip positions enable you to be able to develop your back, chest, shoulders, arms, and abdominal muscles with one simple piece of equipment. The bar now also includes 2 optional slip-on foam grips for the outermost handles to protect your doorframe. In addition to traditional pull-ups and chin-ups, the bar allows you to perform closed-wide angle and hammer grips as well as multiple leg raises and oblique curls. Built to last, the Multi-Grip Pull-Up Bar is constructed of high-grade steel for durability, safety, and long-term use. The bar can hold up to 300 pounds within a sturdy doorframe, making it ideal for a variety of users. 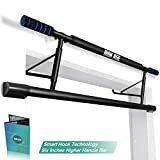 This is one of the best pull-up bars on the market, yet we sell it at an incredibly affordable price to make home workouts convenient and accessible to anyone. Train like a pro, train with ProsourceFit! 2. Medium-duty door mounts: 150 lbs / 68 kilograms - Do not use above waist height. The new Ceiling Mount Pull Up Bar with Reversible Risers is designed to increase gains and reduce strain during your pullup workouts. With ideal 20" spacing on the neutral grips and angled bar for a more natural grip position, the Ceiling Mount Pull Up Bar targets specific muscle groups for the results you want in less time. Whether you are installing below floor joists spaced 16" on-center or ceiling joists with 24" on-center spacing, the Dual Position Risers fit any floor in your home and preserve floor space for expanded exercises with bar accessories. With a more natural hand position during chin ups, parallel grip and wide grip pullups, the angled grips reduce strain on your shoulders, wrists and elbows. Comfortably spaced at 20", the parallel grips are a great fit for just about every build. The bar drops 14" from your ceiling for plenty of head room and full range of motion. A mounted pull up bar is the ideal anchor for Bodyweight Resistance Trainers. Bodyweight Resistance Trainers expand your workouts with compound movements and enable assisted pull up variations so you can effectively work up to full pull ups. At Ultimate Body Press we are proud to serve your gym needs and want to exceed your expectations for customer service. Customer service has complete resources to assist you and is available by phone or email. Your satisfaction is 100% guaranteed, order your Ceiling Mount Pull Up Bar today. One-piece solid steel bar features a black powder coating to prevent rust and corrosion. Designed for 16" and 24" stud space. Perfect for working out your backs, shoulder, chest, arms, triceps, biceps, lats, and the front of your abs. Designed for easy installation. Full instructions & all mounting hardware are included. 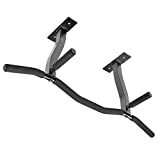 YES4ALL WALL MOUNT CHIN UP BARYes4all Chin Up Bar is a must have item in your fitness tool collection. Chin up bar exercise is one of the most effective ways to target the latissimus dorsa muscle in your back and also for your arms. MULTIPLE GRIP POSITIONS The bar offers several grip positions- including wide grips, neutral grips, and narrow grips, which helps you to do a variety of upper body exercises from wide- grip pull ups, band assisted chin ups to hanging leg raises and many more. Ready to alter your grips to vary resistance and target different muscle groups! Work out your backs, shoulder, chest, arms, triceps, biceps, last, and the front of your abs!! 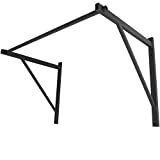 !SOLID STEEL CONSTRUCTION AND INNOVATIVE DESIGN Heavy duty gauge steel frame is coated with black non-slip powder coat finish for visual appeal. Steel grips with padded foam for non hand fatigue and added comfort. Designed for 16" and 24" stud space. It means your mounting holes meet your wall studs exactly 16 inch or 24" on center. The bar is well made, smooth, no burrs or rough edges, and installed easily in a flash. Maximum Weight Capacity: 300lbsFull assembly and mounting instructions for installation are provided and all mounting hardware is included. BASIC & NEW UPGRADED VERSION - CHOOSE YOURS: Two-piece bar and one solid steel construction for more toughness and durability. 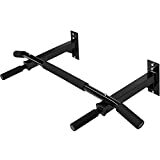 In additon to being the owner of Iron Age pull up bar, I’m also a lifelong pull-upper, who was extremely disappointed of the easy-bending and door-damaging bars in the market. So I decided to design a pullup bar both worthy of both my workout and my woodwork with . After three years' hard working with my our team, we have the ultimate Iron Age leverage-based multi-grip portable doorway chin up bar. Thanks to the Smart Hook Technology who applies the theory known as the Lever Law, Our door bar is with very compact structure, very solid and space-saving. Not a single screw is needed to stall, if you know how to tie your shoes, you will know how to install it within 15 seconds. Your doorframe is under great protection with no danger of being damaged. You will love it so much that you will be unwilling to take it off the doorframe even not in use. And with no doubt, The Iron Age Pull-Up Bar takes up the least space than all the other competitors in the market.